I was excited to see that the May Daring Bakers Challenge was another cake. An Opera Cake, to be exact. I had never heard of it before. So what is an Opéra Cake (OC)? The classic Opera Cake is a work in six acts. There are three thin layers of almond cake, each soaked in a potent coffee syrup; a layer of espresso-flavored buttercream; one layer of bittersweet chocolate ganache; and a topping of chocolate glaze. Although an OC is supposed to be made with coffee and chocolate, the challenge hosts specifically requested that no 'dark' elements be used in this challenge. Therefore, we were supposed to use 'light' flavors and colorings such as white chocolate, lemon, coconut, etc. I stuck with lemon mousse and coconut buttercream. Following are my notes from this challenge. - I made the altered buttercream version given in the challenge recipe. Don't like it!!!! It is goopy. If I do it again, I will do the buttercream from the Party Perfect Cake instead. I think that's why some pictures of people's cakes have goopy looking filling. - My joconde (the almond cake layers) came out of the pan with tattered edges, so I cut mine at 9 inches instead so I got better edges. It also meant I had a little left over to make a single serving taster. :-) Oh, and it also came out uneven. It's important to spread the batter as evenly as possible in the pan. One was thicker than the other because I obviously didn't split the batter in half accurately. You are supposed to soak the layers with espresso (traditionally). Here I used a coconut syrup. -Because I disliked the buttercream I tried to spread it as thin as I could. I had not wanted to do the mousse because of the cost of this recipe, but decided to do it after I found out I hated the buttercream. This is why the picture hardly shows the icing between the layers. - Others had said not to use white chocolate chips, which I had already bought. $$$$$ Between the cost of the chocolate and the cost of gas going around town trying to fine good quality white chocolate in a bar, this is one expensive recipe. Finally ended up using Ghiradelli Premier Baking Bars. But those are 4 oz, so I bought 3 and then just added a little less cream hoping that the consistency would be right. Here I am putting on the mousse. Overall assessment? First, expensive! Second, time consuming. But you can make the buttercream and the mousse a few days in advance. Taste? OK. I think my hatred of the buttercream was a big factor. Basically I think I need to try this cake again the proper way - with chocolate! I'm sure it will be fabulous then. The white chocolate used in the glaze and mousse was alright, but the whole thing seemed to not have the real decadence I was expecting. I think the chocolate is an important factor here. 1.Divide the oven into thirds by positioning a rack in the upper third of the oven and the lower third of the oven. 2.Preheat the oven to 425◦F. (220◦C). 3.Line two 12½ x 15½- inch (31 x 39-cm) jelly-roll pans with parchment paper and brush with melted butter. 4.In the bowl of a stand mixer fitted with the whisk attachment (or using a handheld mixer), beat the egg whites until they form soft peaks. Add the granulated sugar and beat until the peaks are stiff and glossy. If you do not have another mixer bowl, gently scrape the meringue into another bowl and set aside. 5.If you only have one bowl, wash it after removing the egg whites or if you have a second bowl, use that one. Attach the paddle attachment to the stand mixer (or using a handheld mixer again) and beat the almonds, icing sugar and eggs on medium speed until light and voluminous, about 3 minutes. 6.Add the flour and beat on low speed until the flour is just combined (be very careful not to overmix here!!!). 7.Using a rubber spatula, gently fold the meringue into the almond mixture and then fold in the melted butter. Divide the batter between the pans and spread it evenly to cover the entire surface of each pan. 8.Bake the cake layers until they are lightly browned and just springy to the touch. This could take anywhere from 5 to 9 minutes depending on your oven. Place one jelly-roll pan in the middle of the oven and the second jelly-roll pan in the bottom third of the oven. 9.Put the pans on a heatproof counter and run a sharp knife along the edges of the cake to loosen it from the pan. Cover each with a sheet of parchment or wax paper, turn the pans over, and unmold. 10.Carefully peel away the parchment, then turn the parchment over and use it to cover the cakes. Let the cakes cool to room temperature. 1.Stir all the syrup ingredients together in the saucepan and bring to a boil. 2.Remove from the heat and let cool to room temperature. 1.Combine the sugar, water and vanilla bean seeds or extract in a small saucepan and warm over medium heat just until the sugar dissolves. 2.Continue to cook, without stirring, until the syrup reaches 225◦F (107◦C) [*Note: Original recipe indicates a temperature of 255◦F (124◦C), however, when testing the recipe I found that this was too high so we heated to 225◦F and it worked fine] on a candy or instant-read thermometer. Once it reaches that temperature, remove the syrup from the heat. 3.While the syrup is heating, begin whisking the egg and egg yolk at high speed in the bowl of your mixer using the whisk attachment. Whisk them until they are pale and foamy. 4.When the sugar syrup reaches the correct temperature and you remove it from the heat, reduce the mixer speed to low speed and begin slowly (very slowly) pouring the syrup down the side of the bowl being very careful not to splatter the syrup into the path of the whisk attachment. Some of the syrup will spin onto the sides of the bowl but don’t worry about this and don’t try to stir it into the mixture as it will harden! 5.Raise the speed to medium-high and continue beating until the eggs are thick and satiny and the mixture is cool to the touch (about 5 minutes or so). 6.While the egg mixture is beating, place the softened butter in a bowl and mash it with a spatula until you have a soft creamy mass. 7.With the mixer on medium speed, begin adding in two-tablespoon chunks. When all the butter has been incorporated, raise the mixer speed to high and beat until the buttercream is thick and shiny. 8.At this point add in your flavouring and beat for an additional minute or so. 9.Refrigerate the buttercream, stirring it often, until it’s set enough (firm enough) to spread when topped with a layer of cake (about 20 minutes). 1.Melt the white chocolate and the 3 tbsp. of heavy cream in a small saucepan. 2.Stir to ensure that it’s smooth and that the chocolate is melted. Add the tablespoon of liqueur to the chocolate and stir. Set aside to cool completely. 3.In the bowl of a stand mixer, whip the remaining 1 cup of heavy cream until soft peaks form. 4.Gently fold the whipped cream into the cooled chocolate to form a mousse. 5.If it’s too thin, refrigerate it for a bit until it’s spreadable. 6.If you’re not going to use it right away, refrigerate until you’re ready to use. 1.Melt the white chocolate with the heavy cream. Whisk the mixture gently until smooth. 2.Let cool for 10 minutes and then pour over the chilled cake. Using a long metal cake spatula, smooth out into an even layer. 3.Place the cake into the refrigerator for 30 minutes to set. (Note: The finished cake should be served slightly chilled. It can be kept in the refrigerator for up to 1 day). Line a baking sheet with parchment or wax paper. Working with one sheet of cake at a time, cut and trim each sheet so that you have two pieces (from each cake so you’ll have four pieces in total): one 10-inch (25-cm) square and one 10 x 5-inch (25 x 12½-cm) rectangle. Place one square of cake on the baking sheet and moisten it gently with the flavoured syrup. Spread about one-third of the buttercream over this layer. 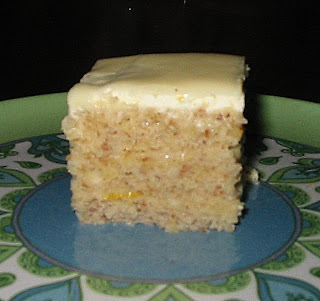 Top with the two rectangular pieces of cake, placing them side by side to form a square. Moisten these pieces with the flavoured syrup. Spread another third of the buttercream on the cake and then top with the third square of joconde. Use the remaining syrup to wet the joconde. Spread the remaining buttercream on top of the final layer of joconde and then refrigerate until very firm (at least half an hour). Make the glaze and after it has cooled, pour/spread it over the top of the chilled cake. Refrigerate the cake again to set the glaze. Serve the cake slightly chilled. This recipe will yield approximately 20 servings. Spread about three-quarters of the buttercream over this layer. Spread the remaining buttercream on the cake and then top with the third square of joconde. Use the remaining syrup to wet the joconde and then refrigerate until very firm (at least half an hour). Prepare the ganache/mousse (if you haven’t already) and then spread it on the top of the last layer of the joconde. Refrigerate for at least two to three hours to give the ganache/mousse the opportunity to firm up. Sacramento blogger learning where my food comes from and enjoying life around me. Please check out my BIO and FREELANCE WRITING.